Update: Introducing Daala part 4 now posted! ...they faced the prospect of performing frequency domain intra-prediction involving multiple, nonhomogeneous input and output block sizes. Aside from just being complicated, each possible combination would require its own set of prediction matrices, some quite large. The combinatorics alone render this scheme impractical. Wouldn't it be nice if they could change blocksizes by splitting blocks apart and merging blocks together? It would avoid the whole problem! As it turns out, they ...ahem... we can! To escape certain death under a crushing mound of different blocksizes, we borrow a previous invention, Time/Frequency Resolution Switching ('TF' for short), from our Opus audio codec. TF allows us to split apart or merge together blocks while staying in the frequency domain. By altering the blocksizes, we can eliminate the nonhomogeneity and reduce both the size and number of required prediction matrices. For example, we could TF surrounding blocks to match the size of our input block, or always run prediction at a 4x4 blocksize. TF is useful in a number of other places as well, so it's worth describing in some detail. Let's start by looking at what we want, what we really need, and then how TF delivers. Obviously, we want TF to be as cheap to compute as possible. We'd like to avoid multiplies if possible, and reversing and re-computing the DCT for each blocksize is right out. It would also be nice if our transform showed uniform/unit scaling, minimal dynamic range expansion, and complete reversibility. In short, what we really wish we could do is switch between multiple lapped blocksizes as if we'd done DCTs for every possible combination, and we want it for as close to free as possible. Not surprisingly, it turns out we can't get everything we want. Our lapped transform uses a fast DCT, a member of the FFT family. All FFT-like transform structures begin with an initial 'butterfly' that operates pairwise on interleaved samples spread across the spatial input. Even though we can split most of a DCT in half down the middle of the input block, we can't split the first step. To merge two blocks or split blocks in half such that they're equivalent to the other transform size, we would in fact have to unwind all the way back to the spatial domain and recalculate the entire DCT. Figure 1: A simplified illustration of the butterflies in an eight-point FFT (leaving out the weighting factors). 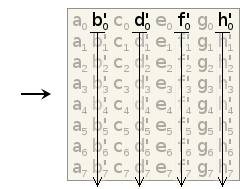 This underlying structure is the same whether the FFT is decimation-in-frequency, normally drawn with the inputs in ascending order, or decimation-in-time, normally drawn with the inputs bitreversed and the frequency coefficients in ascending order. Other transforms in the FFT family, such as the fast DCT, have a similar structure. Regardless of how it's drawn, the butterflies in the first stage require inputs from both halves of the spatial input vector. We cannot split the original spatial vector 'in half' in the frequency domain without first reversing the entire process. Similarly, merging two blocks requires adding a new stage to the beginning of the computation, not end. As such, merging two spatial blocks in the frequency domain also requires first inverting the original FFT. So, we can't split a DCT in half or merge two DCTs together without first unrolling them, and unrolling is too expensive. Even if we did, we'll run into lapping issues that still rob us of perfect victory. However we do this, we'll have to be satisfied with an approximation to the perfect TF transform we wish we could have. To find this approximation, we ask ourselves "What are we really trying to do?" When we merge four blocks together into a single larger block, we're beginning with four neighboring frequency-domain blocks. These blocks may be frequency coefficients, but the relationship between coefficients in neighboring blocks is spatial. We want to transform that spatial relationship into the frequency domain. Splitting is the converse, converting a frequency relationship into a spatial relationship. Ironically enough, we do this with a DCT! Taking four colocated frequency coefficients from neighboring blocks, a 2x2 forward DCT converts their spatial relationship into frequency. Similarly, taking a 2x2 block of frequency coefficients from a single block and using an inverse DCT, we convert their frequency relationship into a spatial relationship. The resulting output is not the same as recomputing the entire DCT of a different blocksize from scratch, but it does give us the frequency-domain approximation we're looking for— and the 2x2 case involves no multiplies. Figure 2: Frequency-domain blocks can be split or merged by iterative application of the 2x2 TF transform to groups of four frequency coefficients at a time. The diagram above shows the location of input and output coefficients in the source and destination blocks. 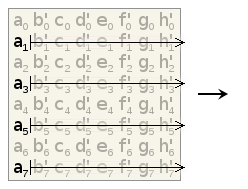 Note that coefficient ordering in the large block alternates in a folded pattern because the DCT is a symmetric (rather than circular) transform. An implementation can achieve the same effect by adjusting the signs of the coefficients of the small blocks rather than reordering the coefficients of the large block. We also need a four-point transform to transform 4x4 blocks to 16x16 blocks and vice versa. Unfortunately, a four-point DCT requires multiplies. Of course, we could use a two-point DCT to transform from 4x4 to 8x8 and then use a two-point DCT again from 8x8 to 16x16. The resulting transform isn't a DCT though; it's a Walsh-Hadamard Transform (WHT). Technically, the two-point DCT and WHT (and Haar Wavelet Transform for that matter) are equivalent. As we've just noted, you can't build a larger DCT by stacking smaller DCTs. However, stacking two identical Walsh-Hadamard transforms does result in a WHT of twice the size. Since the two-point cases are the same, that's why our stacked 2x2 'DCT' magically transformed into a 4x4 WHT. As transform size increases, the WHT remains cheap to compute (no multiplies). In Daala, of course, we need only the 2x2 and 4x4 WHT. Figure 3: The basis functions of the 4x4 Discrete Cosine Transform, the 4x4 Walsh-Hadamard Transform, and the 4x4 Haar Wavelet Transform, illustrating the similarities between the three transforms. Invertibility and Scaling: More Velcro®! "We're in zero-G. How do you keep your coffee cup on the table?" The remaining properties on our wishlist are unit/uniform scaling (all outputs are scaled by a factor of 1), minimal range expansion, and exact reversibility in an integer implementation. We used lifting filters before to implement a lapped transform with these properties, so we'll use more lifting to do the same for TF. This is a bit low-level, but it's fun to walk through the logic of designing the lifts. It's simple and gives the right answer. Of course, it has an obvious problem; the output is scaled up by a factor of √2 with each step. After we stack them, the final 2x2 transform's output will be scaled up by a factor of two and the dynamic range quadrupled. This achieves the goal of not scaling the overall output, but now the output scaling isn't uniform. The upper leg's output is scaled by half relative to the lower leg. This is the choice we appear to be stuck with: the outputs being scaled up, or output scale asymmetry. At this point, we have a little collection of four asymmetric lifting stages. Each reversibly computes a 2 point WHT without scaling the overall output, but the individual outputs/inputs are asymmetrically scaled relative to each other. Then we realize these asymmetries are all complementary! And with that, we have a fast, reversible 2x2 WHT with unit scaling, the minimum possible range expansion (doubled), and no multiplies. It has one other useful quirk— it's its own bit-exact reverse. We don't even need to implement an inverted version. And, of course, we can use this exact same filter implementation to split blocks as well as merge them. Note that this is not the only possible implementation. We can shuffle the asymmetries and sequence of operations to implement versions with slightly different integer rounding behavior. The implementation shown here matches the Daala source as of August 2, 2013. We submitted this WHT plus a few variants to Google for use in VP9's lossless coding mode; they chose one of the alternate versions of the WHT illustrated above. TF as we've implemented above is a very-cheap-to-compute approximation of the transform we were actually aiming for: a true DCT of the alternate blocksize. How good is this approximation? Let's use something easy to see: transformed basis functions. We start with a grid of 4x4 blocks, with alternating blocks containing one of the 4x4 DCT basis functions. We transform each block into the frequency domain with a 4x4 DCT. The output blocks contain a single non-zero frequency coefficient each, confirmation that our inputs are basis functions. This is the ideal 4x4 output that we'll compare to 4x4 blocks we manufacture using TF splitting. Figure 4: Illustration of 4x4 blocks of pixels transformed into 4x4 blocks of frequency coefficients using the DCT. Alternating blocks of pixels hold the 4x4 DCT basis functions. When transformed, the frequency-domain output of these basis blocks has a single non-zero frequency coefficient, making comparison to the TF output in Figure 6 easier. Figure 5: Beginning with the same input pixels as above, we instead group them into 8x8 blocks and transform them into the frequency domain using an 8x8 DCT. We will then split each 8x8 block of frequency coefficients (above right) into four 4x4 blocks of frequency coefficients using TF (below). Finally we split each 8x8 frequency domain block into four 4x4 blocks using TF. Compare the 4x4 TF output to the output produced directly by the 4x4 DCT (two diagrams above). Figure 6: Illustration of TF splitting 8x8 frequency-domain blocks into 4x4 frequency domain blocks. A perfect TF process would produce the same 4x4 frequency-domain blocks as a direct DCT transform. However, our TF implementation is approximate; we see that our 4x4 frequency-domain blocks are similar but not identical to the output produced directly from a direct 4x4 DCT (Figure 4, right). Figure 7: Comparison of frequency domain blocks produced by an 8x8 DCT (above center), and manufactured from 4x4 blocks using TF merging (above right). The spatial domain pixels that were used for the transform input appear above left. Neither the split nor the merge are that bad of an approximation for such a cheap transform... but we notice something in the TF-merge results. There's an obvious pattern to the output error that's partly position-invariant with respect to the nonzero coefficient. Earlier, I said that different DCT transform sizes differ in the number of stages at the beginning (not end) of the transform, and so there's no way to alter the transformed blocksize of a DCT without first completely undoing the DCT. That's not quite true; we can change the blocksize of a DCT after the fact, but it theoretically requires N^2 operations. Completely recomputing the DCT is cheaper. Figure 8: Schematic representation of a second-stage for the TF transform. The second stage lifting filter applies in-place to the rows and then the columns of the first stage output. When lifting the rows, the filter processes only odd columns. When lifting columns, the filter processes only odd rows. 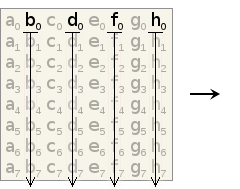 The same filter is used for rows and columns. Figure 9: Output of the original single-stage 4x4->8x8 TF merge (left), the improved two-stage TF merge (center), and our ideal output from the 8x8 DCT (right). The second TF stage dramatically improves TF approximation of the larger DCT blocksize. We build a two-stage TF split transform as expected; use the inverse of the second stage filter as a prefilter to the one-stage splitting transform. The additional filter stage improves splitting as much as it improves merging. Figure 10: Output of the original single-stage 8x8->4x4 TF split (left), the improved two-stage TF split (center), and the 4x4 DCT (right). The additional TF stage also improves splitting, as expected. We can continue improving the filter to come arbitrarily close to the exact DCT output if we want. For example, six additional add/shift operations can further reduce output error by half. However, the cost of larger filters yields steeply diminishing returns. We've spent this whole time looking at transformed basis functions, mainly because the sparse frequency domain makes error very easy to see. Below, we see TF merge/split used as an approximation to the DCT, as applied to a real image. This is only a single image example, but the results are representative of general behavior. Figure 11: The left and center images above illustrate how well a single-stage and two-stage TF merge respectively approximate a DCT of a larger block size. The image was blocked and converted to the frequency domain using unlapped 4x4 DCTs, the blocks merged into 8x8 frequency-domain blocks by TF, and then converted back into pixels using larger 8x8 DCTs. The original image appears on the right. All three images appear here magnified by 2x. Figure 12: The left and center images above illustrate how well a single-stage and two-stage TF split respectively approximate a DCT of a smaller block size. The image was blocked and converted to the frequency domain using unlapped 8x8 DCTs, the blocks split into 4x4 frequency-domain blocks by TF, and then converted back into pixels using smaller 4x4 DCTs. The original image appears on the right. All three images appear here magnified by 2x. There's a glaring 'error' in all of the above TF work: we've been modeling performance of the DCT, not our lapped transform. Single-stage TF using a WHT is a rough enough approximation that lapped or not makes relatively little difference. However, the second TF stage dramatically improves results, and it's possible that it could be (and should be) tuned to our lapped transform rather than the DCT. We also shouldn't forget that TF isn't just low-cost, it's a reversible transform. Our new-and-improved TF, or a variant of it, may show sufficient coding gain that we could potentially use it to replace larger DCT blocksizes entirely. In one possible scenario, we'd transform everything as a 4x4 lapped transform and build larger blocksizes from TF. That would increase speed and solve all our various heterogeneous blocksize problems-- if it actually works. Call that future research for now. There's also still quite a bit to cover in the overall Daala design. Next demo, I think we'll look at another place we use TF: Predicting the Chroma planes from the Luma plane (page now up!). Corrected an error in whtas7.png reported by jmf on August 10, 2015; the output values of b' and c' were transposed.